Mike Brown and COLAB are just getting started in SLO County. Gibson is in his 2nd term while COLAB is just starting their 2nd term (4 year terms). It takes a while to see, educate and arm citizens to fight back for their rights. Citizens are waking up to ordinance upon ordinance being proposed and imposed. Predetermined outcomes and Delphi Stakeholder meetings are all the rage and soon will be impotent. Once my neighbors eyes are open this house of cards will fall. Democrat competition is on its way. Not all Democrats are Globalist-Progessives. The one that will defeat Gibson is a Democrat that loves freedom! Gibson and Hill are creating a “crisis” so they can swoop in and be heroes. Facts do matter and your next “crisis” may be just the tool that will be your undoing. Agreed. A Republican can’t win that seat. Gibson’s worst nightmare will be a fellow Democrat…but one who is well-liked and respected, scandal-free, married, without a girlfriend/boyfriend on the side. Gibson’s days are numbered. I was wondering how Bruce was going to try to pull this one off. “COLAB, Tea Party”, what a smokescreen! The is the 2nd District, as liberal as the 5th is conservative. The only question is which liberal. You think Debbie Arnold could move to the 2nd and win? I am not as interested in his attacks on the non-existent 2nd district right as the suppression of other, possible preferable, candidates having similar political philosophy. Yeah. What is he going to if someone of similar political philosophy runs. That’s his worst nightmare. I think we just saw the shot across the bow. He’s promising hell for any challenger. Sorry, meant the 1st, not the more middle 5th (Arnold/Patterson), as the conservative district. CCN needs to let us edit our spew if they expect any accuracy. You think CCN expects accuracy from anonymous commenters on the internet? If you don’t like the free message board CCN provides for comments, then go elsewhere to post. The fact is that most Supervisors finishing up their second term would run on what they have accomplished in the past two terms. This email just focuses a spotlight on the insignificance of the things that Gibson has done over the years. Nada. Nothing for the constituents in his district. If he’s such an expert on water why is Cambria still without a reliable source after all this time in office? What about the Cayucos sewer? Where did he stand on that? Without Sam Blakeslee the Los Osos sewer wouldn’t have happened. Exactly what has the 2nd District Supervisor accomplished for the people of his district excluding disgusting them with his personal life? Again, I ask a simple question: What statements from Gibson in the materials quoted in the story are not correct? I don’t see a single one that is not true. Get real, please! It’s time for the anti-environmentalist extremists and Mike Brown pawns and COLAB cult members/suckers to be intellectually honest. Comments about his extramaritial affair with a subordinate legal assistant occurred because of Gibson’s own actions. It was his extramarital duplicity that made many believe that the same lack of marital ethics would be found in his ethics as a county supervisor. In addition, many comments raised issues about how Gibson had put himself, the county and its taxpayers at risk for sexual-harassment (and other) liability. Gibson is Aisporo’s supervisor, and Aisporo (except for a brief period until county legal counsel drew up a meaningless document in which promises were made not to sue each other) took her work directions from Gibson. While Gibson wants to paint the uproar over his lack of ethics as being “attacking” him “personally,” for the most part, it has not been personally. Most county residents believe that the least they can expect from a county supervisor is that they don’t go out of their way to put the taxpayers at risk for multi-million-dollar lawsuits. That Gibson has gone out of his way to put us all at risk for multi-million-dollar lawsuits is, however, just one of the problems county residents have over the Aisporo affair. 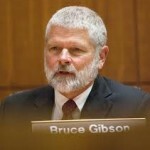 In addition, his lack of inability to keep his word in his marriage, and the ease with which he broke his marital promises, also raise questions about Gibson’s ability to keep the promises, as a supervisor, he made to the county residents. Gibson’s problems related to his affair with Aisporo are of his own making. If you don’t like people criticizing county supervisors who break their promises and put county taxpayers at considerable financial risk, then talk to Gibson about his behavior. Gibson’s behavior is the source of the message. Those criticizing Gibson for his behavior are simply the messengers. What you write, Mary, does not show any contradictions or untruths in Gibson’s statements quoted in the story. In fact, your statements confirm what he writes. YOU are attacking him “personally” based, at least in part, on events in his private life. You can try spinning it all you want, but what he wrote is true. And even if you wont accept that you are attacking him personally for actions in his private life, I submit to you that others have and will continue doing so. I want to know if one of Gibson’s staunch supporters has illegally constructed a hydro electric power plant and is in the process to sell the energy to PG&E? Yes, in the North County, the Gibson land of water wasters. LOL. I’d love to hear Gibson spin your question as being a personal attack on him because of his affair. $1000 going to the best candidate that can beat him. Time to clean out the special interest with him and Hill. Why not? It works for so many democrats and their sheep; the republicans are so slow and lame (and greedy here) they won’t know what to do anyway. It’s a slam-dunk. When you preach to the most ill-informed, politically-ignorant about the evils you’re fighting, no one will ever think to notice what a piece of human waste you are. Works. Ever. Time. …in other words, Common Core is being implemented and ramped up, no better way to keep the ignorant masses ignorant! Hooray for circular degeneration in politics and society! Yay! If I were a dishonest crooked scoundrel that had a huge political ego and wanted to sneak into public office… I’d do it as a democrat No media scrutiny and as you stated a low information constituency. I, for one, will actively campaign AGAINST you Bruce. You have no place in my government. Get a job in the private sector and see how your little affairs and bullying will serve you. Good luck with that. I love the thumb down supporters that think this guy s O.K. What a hoot! “You have no interest in these droids” type of campaigning, eh?